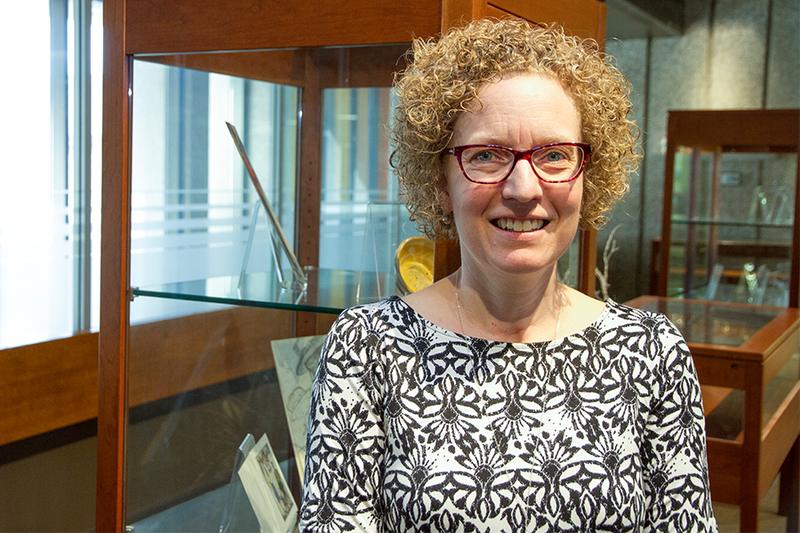 Charlene Sorensen, interim dean of the University Library. Over the next decade, the University Library will write a new chapter that will include changes to physical spaces and services offered in order to respond to the changing information landscape. Guiding this change, explained Charlene Sorensen, interim dean of the University Library, is a master plan that will be developed over the coming months with the help of the entire university community. "We are looking at all of our library space so we can figure out where we are heading, what space can be used for; that's something we can't decide as we go," said Sorensen. "I always compare this process to painting your house—you have all these rooms to paint and you need a plan to co-ordinate the process and achieve a cohesive result." Building on the broad changes to the ground and first floors of the Murray Library—which included the creation of the learning commons, a number of group spaces, the writing and math help centres and a Starbucks—this master plan will outline steps for each library space on campus. "All seven library branches will be part of a process to determine how these spaces can best be used," said Sorensen, adding that Group2 Architecture Interior Design will create the master plan through extensive consultation with faculty, students and staff at the U of S. "This is about determining what is ideal for our libraries and figuring out the steps to get to the ideal." While Sorensen said changes have yet to be determined, she was clear that changes are needed and will continue the work of the past decade that saw the refurbishing of spaces and reconfiguring of collections. "For more than a decade we have seen changes in the way libraries are used. Because of the explosion of digital information, libraries need to be more on-demand than ever before," she said, adding that while visitor numbers at most U of S library branches continue to grow by leaps and bounds, print collection use has gone in the opposite direction. "The digital age has brought transformative change to the scholarly information environment and has dramatically changed the way faculty and students use libraries. The need for change remains and is vital to ensure our library continues to meet the information needs of the campus community," said Sorensen. "It is time to transform the University Library. It is good for the students to help them achieve their academic and research goals. It will also address changes in how research is done and knowledge created. We are excited that the university sees the library as a priority." Students and faculty, Sorensen continued, see the potential of libraries at other institutions, like the University of Calgary and Concordia University, and they "will wonder why we don't have that here at the U of S. This will help keep us competitive in post-secondary education." In broad strokes, Sorensen continued, potential changes will include refurbishment, revitalization, and transformation of library collections, services and facilities. "Overall, we are looking at how prime real estate should be used so that it is active space for learning, research and study," said Sorensen, adding that some examples of how space could be used include makerspace (creative, DIY space where people can gather to create, invent and learn), research commons for debate, discussion and collaboration, display and exhibit spaces, and quiet space to study and reflect. University Archives and Special Collections, currently tucked away on the third floor of the Murray Library, could, for example, see its space improved not only in terms of size with the addition of a digitization centre, but also in terms of access to rare and unique materials and appropriate environmental conditions for the collection. Naturally, the library collection will change as well. "To create these fantastic spaces we do need to do some planning around the collection in advance. "This is not about getting rid of books; books are important. But by changing the way we view our collections in our spaces, we can make the space the best it can be for our users," Sorensen continued. "It doesn't mean books are less important, but it does mean they can be stored in different ways." The collection, Sorensen stressed, will always be available, but because of the declining usage of books, the University Library will be examining how the collection is stored on campus. Sorensen said there are three main ways the library will reconfigure the collection: using compact mobile shelving in the Murray, Science and Health Sciences Libraries; using other storage space on campus; and removing duplicates. To be sure, it is a big undertaking with planning and consultation expected to start in May, with the final master plan anticipated in December. "This is about moving all libraries in chorus," said Sorensen. "But we aren't going to do this unilaterally. We want people from all across campus involved because we know that the process and final outcome will be better with more input." To that end, from May to October "we will be gathering information from the campus community in a variety of ways," Sorensen said. "There will be online surveys, open houses and pop-up consultations all around campus with student consultations starting when they return in the fall." Additionally, a core stakeholder group, consisting of about 40 members from a range of colleges, schools, student groups and administrative units, has been created to ensure all pockets on campus have a voice in the process. Sorensen said that because libraries are for everyone on campus, she hopes everyone will get involved in the process. "There will be so much positive coming from this. This is really exciting."